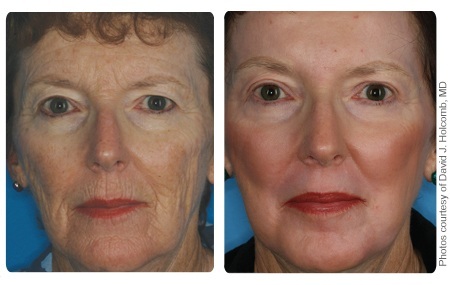 Laser Skin Resurfacing – Skin Rejuvenation and Wrinkle Reduction. Fractional laser skin resurfacing has been featured on the Today Show’s Mini Medical Miracles with Kathy Lee, Entertainment Tonight, Oprah, and The View. Why has it gotten all this attention? For its ability to remove wrinkles, tighten skin, and possibly prevent the need for a facelift later in life. As the body ages the epidermis becomes thinner, so blemishes become more visible. Collagen in the dermis is gradually lost which contributes to the formation of facial lines, sagging skin and wrinkles. Fraxel® is one of the latest innovations in aesthetic laser medical technology. Fraxel® laser is used for anti-aging, collagen remodeling and non-ablative skin resurfacing and provides a highly effective, predictable and safe non-ablative treatment for patients with acne scarring, brown spots, sun damage and stretch marks. The Fraxel® laser is the ideal treatment for acne scarring because it is very effective and there is minimal downtime. Many patients want to look 5 to 10 years younger and so they come to the office to improve their fine wrinkles, sun damage, pigmentation and acne scarring. The Fraxel® laser is an excellent device for this type of patient and in many cases is the laser treatment of choice for acne scarring, enlarged pores, mild to moderate wrinkles, pigmentation, brown spots and sun damage spots. It also produces a substantial improvement in tone, texture and the overall appearance of the skin. The Fraxel® laser is routinely used to treat photo damage from the Sun of the face, neck, chest, hands, and arms. There is an improvement in color, texture, fine lines and wrinkles. It improves acne scars, and scars that occur after surgery or trauma. Now, Fraxel® can safely treat off the face areas, including the neck, chest, back, arms, hands, and abdomen. Other lasers are not used off the face because of the potential risk of scarring. Fraxel Laser Treatment produces thousands of tiny but deep columns of treatment in your skin, known as microthermal treatment zones. This treatment eliminates old epidermal pigmented cells. It also penetrates deep into the dermis. Just as important, though, are the areas of skin the Fraxel laser leaves untouched. 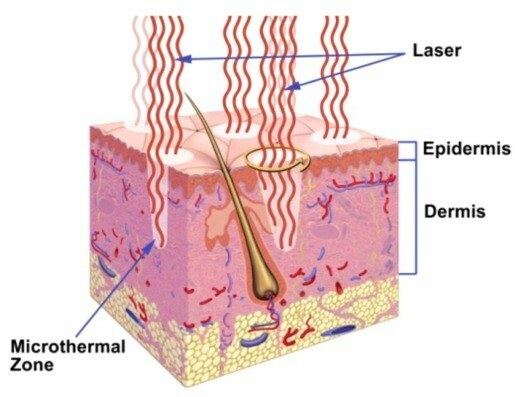 For every microthermal zone the laser targets and treats intensively, it leaves the surrounding tissue unaffected and intact. This fractional treatment allows the skin to heal much faster than if the entire area were treated at once, using the body’s natural healing process to create new, healthy tighter tissue to replace skin imperfections. Because Fraxel Laser treatment spares healthy tissue, it is effective even on delicate skin areas, such as the neck, chest, and hands. We also offer a quick, complimentary post-Fraxel procedure utilizing a Gentlewaves LED Photomodulation which has been proven to enhance Fraxel results and reduce immediate post-treatment redness. While many offices charge in excess of $100 for this treatment alone, we offer it complimentary to ensure the best results and the least downtime to our Fraxel patients.